Rotund rap star Rick Ross was the subject of an identity lawsuit earlier this year filed by a convict named "Freeway" Ricky Ross. Rick Ross the rapper (born William Leonard Roberts II) is a former prison guard, but when he first hit the scene he pretended to be an ex-drug dealer, adopting the moniker of real-life drug dealer "Freeway" Ricky Ross. "Freeway" attempted to sue the rapper for $10 million dollars, but he has officially lost the case. After his release from prison in 1995, "Freeway" claims that his notoriety as a former criminal earned a second meaning for his name, as he was linked to the CIA's "Iran-Contra" political scandal and a massive drug empire in Los Angeles. "Freeway" added that he had a trademark on his name. 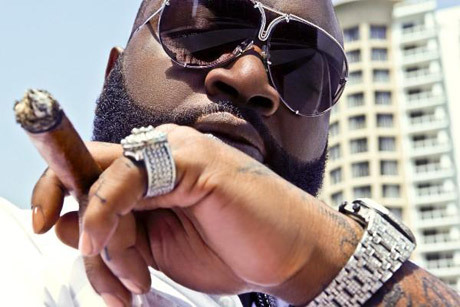 According to the Hollywood Reporter, he attempted to sue rapper Rick Ross on numerous counts, but eventually narrowed down his claims to trademark violation, unfair competition and misappropriation of his publicity rights. A federal judge in Los Angeles dismissed the case on the grounds that "Freeway" Ricky Ross can't legitimately demonstrate a proper copyright on his name. His claim about publicity rights was also filed incorrectly, so that was ignored. If he wants to, "Freeway" can refile the case in a California state court. Worst case scenario, he could try his hand at taking down the rapper named Freeway as well.